1. The east side of the Medina Public Square has for over 175 years been the home of county government offices. 2. In 1840, Commissioners Sheldon Johnson, Timothy Burr and Richard Warner purchased the lot on the corner of Liberty and Broadway Streets owned by Judge Samuel Humphreville for $1,200. The Judge moved his house east on Liberty Street, fitted it up as residence and lived there until death in 1881. 3. 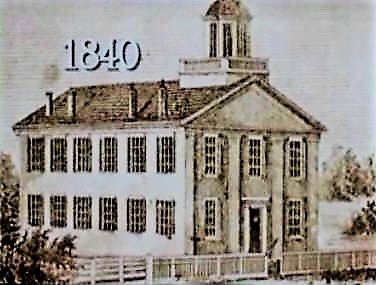 D. H. Weed agreed to build the new court house in trade for the old courthouse and the land it occupied, plus an additional payment to him of $3,100. Weed could not claim these properties, however, until he had finished the new courthouse. 4. The contractor went to work the following year and by August 1841 he had completed the foundation. The entire building was completed later that year. 5. The contract stated that the courthouse was to be built on the southeast corner of Liberty and Broadway Streets, facing west towards the village park, on the present courthouse site. Originally it was a rectangular building of Greek revival style, two stories high like the first courthouse. Three rooms were provided on the first floor and two on the second. There was a hall going down the middle of the floor, at the lower floor, at the end of which was a stairway leading up to the second floor. The building was surmounted by a cupola which was topped by a gilded ball, sixteen inches in diameter. This courthouse was painted with red lead and Spanish brown. 6. In 1871, the Courthouse tower was repaired since they were afraid it would collapse and may have to be taken down. However, the courthouse still needs $10,000 in repairs to the tower. 7. Within a period of thirty years the growth of business resulting from the increasing county population soon made this courthouse building too small to accommodate the added requirements. 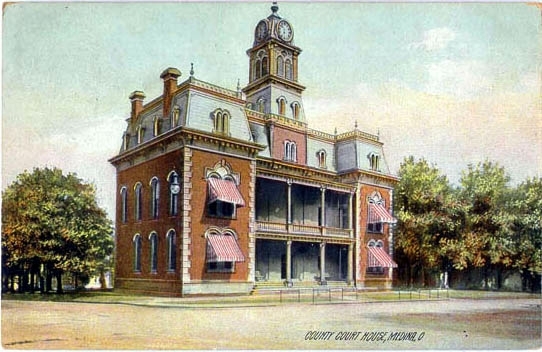 Therefore in July, 1873, the Commissioners, William Kennedy, Benjamin Burt, and Alexander Whiteside, contracted with Medina Architect T. Dudley Allen and William G. Tilley to build a four-room addition for $24,819 on the front of the courthouse which had been completed in 1841. This improvement added two large rooms on both the first and second floors, one on either side in the front, with the intervening space serving below as a re-entrant vestibule and above as a covered balcony. The whole was surmounted by an ornamental belfry, provided with a dial for the tower clock. A bell of about 1000 pounds was hung in the tower, and a vault was constructed for the records and monies of the county. 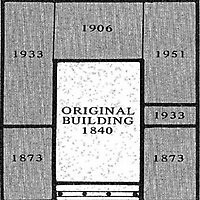 This addition of 1873 now constitutes the front facade of the present courthouse. 8. In 1873, a new flagstaff installed on the courthouse surmounted by a globe of burnished brass 30’ above the dome. The new bell weighs 1100 pounds. 9. In 1879, the new court house tower clock is a Seth Thomas purchased for $600. 10. In 1880, P. C. Parker put in 6 new stone hitching posts, a platform and chains in front of the courthouse. 11. In 1881, O. A. Smith carpenter and builder climbed to the top of the courthouse flag pole for $5. 11A. Early Thursday morning of December 24th 1886, a crowed was gathered outside of the Medina County Court House. At about 1 a.m. the town Marshal was approached by two by two men, whom he assumed were teens just messing around. However, there boys held him up at gunpoint with a revolver stating that if he made any noise they would shoot him. Then three other men came out and placed a gag in the Marshals mouth while putting his coat over his head and tying his hands behind his back. They then took him with them to the court house where two men broke in through the window and two others pried open the door with crowbars. Once inside one man watched the Marshal, two kept a lookout, and the last two worked on the safe. The Marshal remembered hearing four explosions, and at least two times they were dragging something out the doors, although he could not tell if they had actually gotten into the safe. One of the men then said, “We must hurry up before that train come.” Then after three hours, the men had finally left. Now that the Marshal was finally alone he went to the jail and woke the Sheriff, and returned to ring the fire bell. The safe was then opened at about 6:30 a.m. were all the money was safe and sound. 12. In 1897, 36 electric lights were installed at the court house. 13. In 1906, the commissioners found it necessary to make another addition to the courthouse. Positive information about this is not available, but it is thought that the rooms on the back were built at this time, these rooms being the hallway and the record room now used by the County Engineer. 14. In 1910,, the Commissioners bought a Seth Thomas clock from Thomaston CT, with a large cast iron weight just less than one ton used as balance for strike. 15. Arthur Leach custodian winds it once a week. He uses $3 for 2 ounces of oil from fish heads make especially for tower clocks. The 4’ tall bells date from 1873. 15a. It has been a custom with courthouse officials for a good many years to present each one upon the expiration of his term of office with an article of furniture, usually a chair, in token of the esteem and friendship in which the recipient is held by his fellow office holders. 15b. At the beginning of the present year 1915, upon their relinquishment respectively of the offices of Prosecuting Attorney and Sheriff, Arthur VanEpp and Al. Young were made recipients of similar gifts, likewise Claude Hatch when he turned over the office of County Clerk to Lakey Flickinger a few weeks ago. This week marks the exit from office of two more county officials, namely, Eugene Clark as County Recorder and Reuben J. Hyde as County Treasurer, they being succeeded respectively by M. F. Bailey and Charles Franks. 15c. In accordance with the regular custom, these gentlemen became recipients of two beautiful rockers Tuesday morning in the office of the county commissioners. County Auditor Carver presented Mr. Hyde with the latter's chair and Prosecuting Attorney Underwood the other chair to Mr. Clark. Both speakers dwelt at length upon the efficient manner in which the outgoing officials had conducted the affairs of their respective offices and of the genial and social atmosphere which had at all times radiated thru- out the official court house circle. Mr. Hyde and Mr. Clark responded feelingly and the occasion was ended by cordial handshaking. 16. In 1921, Omar Shaw was hired to fix up the front portico of the courthouse which has been crumbling to pieces for some time past. 16a. The Medina Community Band sponsored by the Knights of Pythias (KofP) on the steps of the Medina County Courthouse in. 1915. 17. 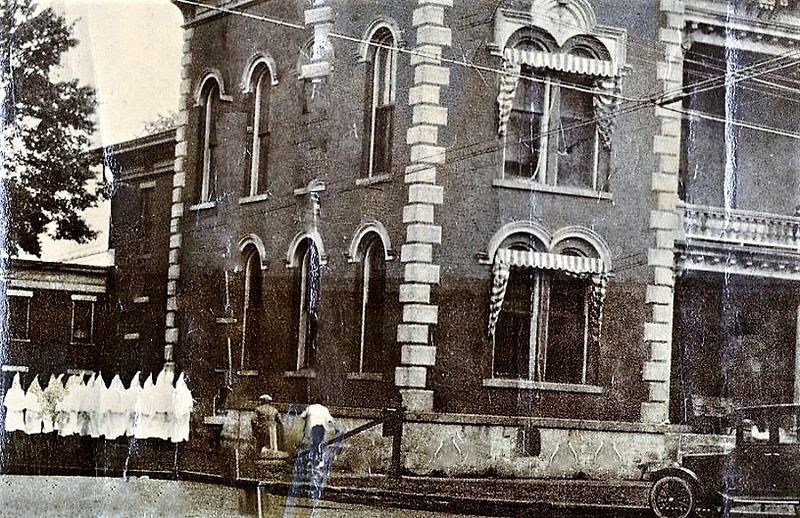 In 1923 The KKK appeared in full regalia in the courthouse on Sunday morning. 18. In 1924, a Cleveland architectural firm is working on a comfort station plans: either between the court house and the jail or on the north side of the courthouse for $5000-6500. 19. The next addition was built in 1933. The Commissioners, R. S. Hartman, R. T. Auble, and Arthur Mong, made a contract for W.P.A. labor to add one room on the north side of the courthouse. 20. In 1934, finally a public restroom will be installed in the basement of the courthouse. It represents the latest work in rest rooms. The entrance is on South Broadway Street at the South west corner of the Court House. 21. In 1937, Mrs. Belle Warner found the Old Cemetery records at the courthouse. The deed was signed in Trumball County on April 29 1836 by Henry M. Boardman the son of Elijah. It was recorded in Medina on September 6 1838 when Oviatt Cole was recorder. It gives the east half of lots 97 and 98 for use as a burying ground forever for $25. 22. In 1945, the 100-year-old courthouse was remodeled. They tore away the old balcony and rebuild the front to make it safe for pedestrians and remodel the porches. Frank Drake of Remsen Corners will remove the 2nd floor porch entirely and replaces it with a concrete balcony. The roof of the second floor part of the balcony will be left off. The old pillars on the first floor will be retained if they can be reinforced. A new concrete beam extends across the front of the building at the balcony with the words “Medina County Court House’ standing out in 12” letters. 23. In 1946, a new courthouse annex will include a room for the Medina County Historical Society and the county commissioners have awarded them a sum for research work on a county history by each township. 24. In 1947, the old Swiss-made clock which hung on the wall of the county auditor’s for 11 yrs has been repaired by Sidney F. High. It was in the First National Bank in 1870. It was purchased by H.H. Brainard when he opened his jewelry store when the bank folded. Son Samuel Brainard gave the clock to the County in 1936 when he closed the jewelry store. 25. In 1952, the Commissioners, Homer Homan, Howard Brintnall, and Clair Eastwood, had an addition like the one of 1933 added to the south side of the courthouse. It was a 2 story structure 17’ x 60’ costing $111,000. 26. In the summer of I960, the Commissioners, Charles W. Mapes, Howard Brintnall, and Charles Williams had the courthouse sand blasted a process which restored the bricks to their original color of over a century ago. 27. On October 7, 1988, Vice President, George H. W. Bush during his campaign for President of the United States as the Republican Candidate, addressed a large crowd of Medina residents from the steps of the Medina Court House. 1. Calvin B. Prentiss served as Postmaster of the village from July 1845 to April, 1849 at a location as yet undetermined (2018). 2. Prentiss, originally from Massachusetts, was elected Medina County’s first Probate judge serving one term. 3. He was admitted to the bar in 1855 and went on to become a successful Lawyer. Dr. Warner was born in New York and moved to Spencer, Ohio in the fall of 1841. He continued to practice medicine until his death, except when serving as Probate Court Judge for six years. He died from Pneumonia in 1872. Barnard was born in 1828 and was admitted to the bar in 1852. He practiced law in Medina County after holding office as probate judge for two terms. Lewis was captain of the One Hundred and Twenty-four Ohio Volunteer Infantry in 1862 and lost his left arm at the battle of Nashville. He was later commissioned as Lieutenant Colonel before coming to Medina in October 1865. He was elected probate judge in 1866. Born in Granger, Ohio in 1829, he was admitted to the bar in 1860. Codding became prosecuting attorney in 1865 before being elected probate judge in 1872. He continued to practice law full time after serving two terms as judge. Munson was admitted to the bar in 1873, later taking office as probate judge. Munson went into private practice following his judgeship. Graves was elected prosecuting attorney in 1876 and served two terms. He continued to practice law in Seville before becoming probate judge in 1885. 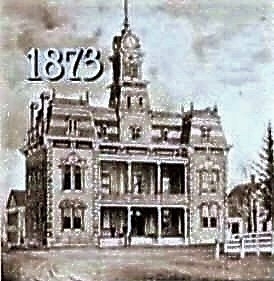 Phillips moved to Medina in 1873 and attended Medina High School. He served as mayor from 1866-1890 and became probate judge in 1892. Richards was admitted to the bar in the spring of 1879. He went into private practice and formed a partnership with ex-judge Barnard before being elected probate judge 1897. Plank began work as a teacher at just 17 years old, later becoming superintendent for Wadsworth schools in 1888. After holding office as judge, he served as a member of the House of Representatives, fuel director for Medina during the World War period and later established an insurance agency. Kennan was a republican elected to the bench after defeating democrat John Owens in the 1908 election with 3,342 votes. Born in Hinckley, Van Deusen was a farmer and teacher until 1893 when he was elected County Clerk of Courts and moved to Medina. He was admitted to the bar in 1899 and practiced law until 1916 when he was elected probate judge. Phillips returned as probate and juvenile judge of Medina County in 1924. He was reelected and served until 1933. He died February 21, 1936 and is now buried in Spring Grove Cemetery. Denton was editor of the Medina Sentinel and the first director for the Board of Trade Band in 1915. Ten years later, he was elected mayor of Medina and held office until 1929 before becoming probate judge in 1933. Kellogg was elected probate judge in 1941, but resigned in 1945 to become an attorney for the Cleveland office of the Veterans Administration. He returned as acting judge in October 1964 and again in March 1968. Derhammer originally from Doylestown, began his work as a pharmacist and enlisted in WW1, serving overseas for 14 months. He was elected clerk of courts in 1936 and appointed probate judge in 1945 by Governor Lausche. Garver, from Wadsworth was appointed Medina County Probate and Juvenile Judge by Governor James A. Rhodes after the death of Judge Derhammer in 1964. Dannley left his position as a State Representative when he was appointed to the bench in 1968, succeeding the late Judge Garver. He was later elected to retain the seat. Elected as Juvenile and Probate Judge in 1985, Skidmore passed away while in office in 1996. Heck was a former prosecutor and appointed to the bench in 1996 to complete the term of Judge Skidmore. She was then elected and served one term, after which she returned to private practice. Lohn was elected to office as Probate and Juvenile Court Judge in 2003. Prior, he served as City prosecutor and law director of Medina city. Lohn’s judicial term wasn’t to end until February, 2015. However, he announced his early retirement in April 2013. Former Chairman of the Republican Party in Medina County and private practice lawyer for 22 years, Dunn was appointed by John Kasich August 5, 2013 to take office for the remainder of Judge Lohn's term.